Fixing garage doors is not an easy task by any means. It is always recommended to call a professional if something goes wrong. 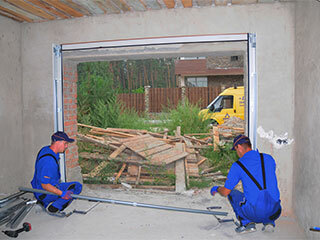 Taking DIY projects can be satisfying, but when it comes to garage doors it is highly recommended to avoid any kind of repair if you are an amateur. Your garage door is doing many tasks for you. It prevents anyone from accessing your home. It safeguards your vehicles and other possessions. It provides a beautiful face for your house. Its safety sensors keep you safe from accidental harm to you and your family. There are a lot of systems that are working in tandem to provide you with such a smooth running operation. We don’t often think about it, but your garage door is working hard to keep you safe and secure. So, when it fails, why trust the complex nature of your garage door to a YouTube tutorial you just watched, or some DIY-er from down the street? It takes a professional to properly service your garage door and keep it running smoothly. If you decide to operate your own repairs, you could be putting your health and your money at risk. There are many dangerous parts in these systems. Take, for example, a broken spring. It’s a common enough occurrence in garage door repairs. Springs lose their tension, and weather and climate all affect the structural integrity of the metal. When a spring breaks, it can be tempting to try and replace it on your own. Without the proper training and tools, you could be putting yourself at serious risk of harm. A spring designed for garage door use is capable containing an enormous amount of potential energy. It’s best to trust this job to someone with the tools to handle the job correctly the first time. Trying a repair on your own could also void the warranties included on the various parts of the door system. If you tamper with or disable certain parts, you could void the factory warranty that safeguards you from early deterioration. This could put you seriously out of pocket when a large malfunction occurs. To replace the door is much more costly than the price of getting a professional to expertly service it, therefore keeping your warranty intact. The temporary savings aren’t worth the risk in the long run. Take advantage of our professional team at Garage Door Repair in Stamford and call any time you need to have your door professionally serviced.